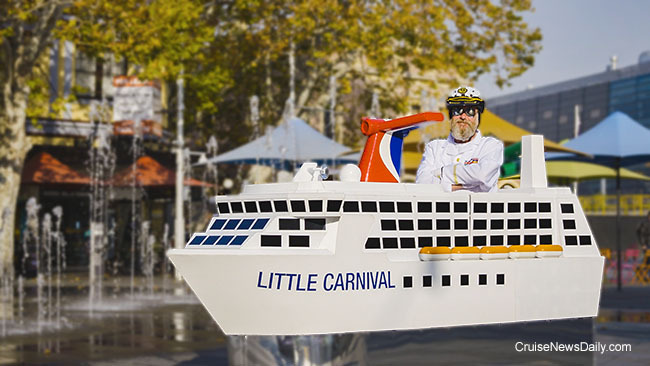 The line also took the opportunity to announce the ship's first captain. The complete story appeared in the June 1 edition of Cruise News Daily. Photos courtesy of AIDA Cruises. All rights reserved. May not be copied or used without express permission. 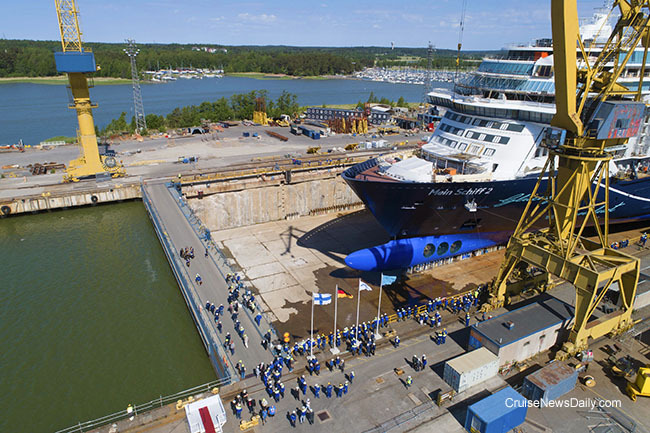 Just a month after Meyer Turku delivered Mein Schiff 1 to TUI Cruises, the yard floated out its sister, Mein Schiff 2, today. Always a special moment in the life of a ship, the first water touched the hull when the floodgates were opened and 300 million liters of water flooded the dry dock. Details appeared in the June 1 edition of Cruise News Daily. Photo courtesy of Meyer Turku. All rights reserved. May not be copied or used without express permission. The Atlantic Hurricane Season starts on Friday (June 1) already, and the folks at InsureMyTrip.com wanted to remind everyone that now is the time to get your trip insurance coverage in order, if you haven't already. What are the chances of a storm? We also give you the latest NOAA prediction. The complete story appeared in the May 31 edition of Cruise News Daily. Photos released by Royal Caribbean and Meyer Werft this week graphically demonstrate Meyer's latest method of ship construction to maximize use of their indoor building dock at their Papenburg (Germany) facility. Details appeared in the May 31 edition of Cruise News Daily. Pride of America canceling its call at Kona again this week. Norwegian Bliss became the largest cruise ship ever christened at Seattle on Wednesday when Seattle radio personality Elvis Duran named the ship in the Emerald City. The complete story appeared in the May 30 edition of Cruise News Daily. Remember the case of the man accused of murdering his wife during a domestic violence incident aboard Emerald Princess during a family vacation in Alaska last July? The man was arrested and held without bond. He is still awaiting trial, and is now going to wait longer. Details appeared in the May 30 edition of Cruise News Daily. 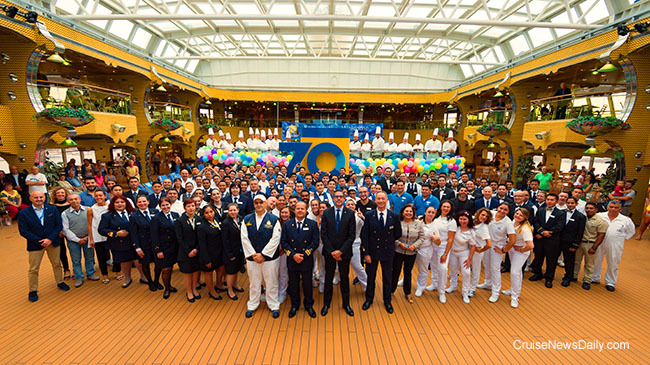 While those of us on this side of the Atlantic had a three-day weekend and observed Memorial Day, Costa partied and observed a big birthday: Its seventieth! The main party last week was aboard Costa Pacifica where about three thousand CostaClub members spent 11 nights on a new Mediterranean itinerary. The complete story appeared in the May 29 edition of Cruise News Daily. Photos courtesy of Costa Crociere. All rights reserved. May not be copied or used without express permission. Crystal was also busy overseas over the holiday weekend. 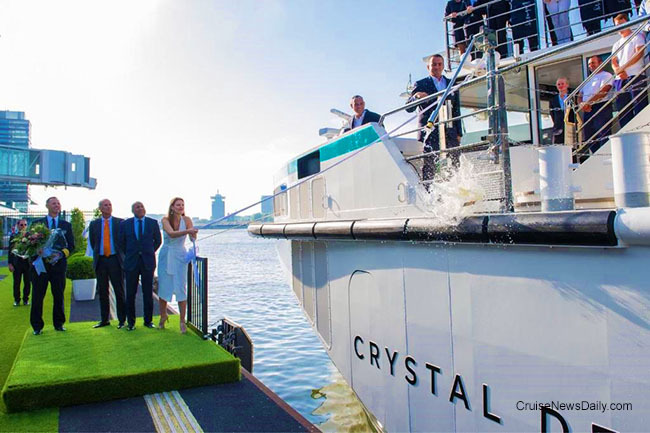 Their river cruise brand christened the third of their newbuild river ships, Crystal Debussy. 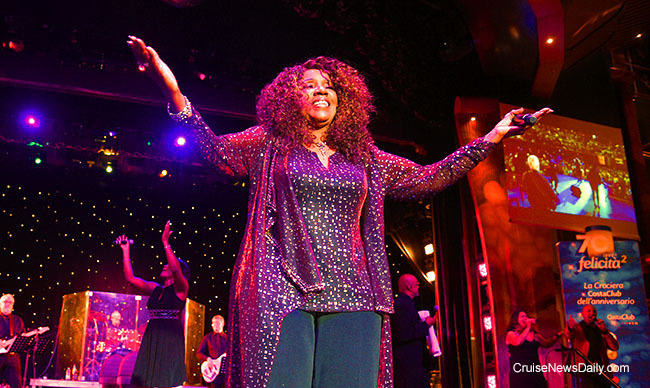 The event took place in Amsterdam during the ships three-day stopover during its 10-day “Splendors of the Rhine” cruise. The ship was named by its godmother, Broadway star Rachel York. Details appeared in the May 29 edition of Cruise News Daily. Photo courtesy of Crystal Cruises. All rights reserved. May not be copied or used without permission.